Laura Moriarty makes process-driven sculptural paintings and works on paper whose forms, colors, textures and patterns result from the same processes that shape and reshape the earth: heating and cooling, erosion, subduction, friction, enfolding, weathering, slippage. Laura's work has been presented in numerous solo and group exhibitions, both nationally and internationally. 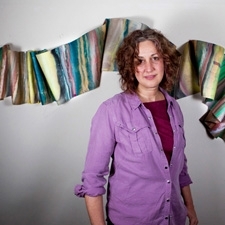 Her honors include an Invididual Support Grant from the Adolph & Esther Gottlieb Foundation, a residency at the Baer Art Center in North Iceland , a Vermont Studio Center Fellowship, two Pollock-Krasner Foundation Grants, a Frans Masereel Center Residency, Belgium , and Ucross Foundation Residency. Her work is featured in several books and publications, and has been reviewed in The Philadelphia Enquirer, The New York Times, Beautiful Decay Magazine, Artillery Magazine, New Art Examiner and The Plain Dealer, among others. She is the author of an artist’s book, 'Table of Contents', self-published in 2012.